BANGOR, MAINE - The Gracie Theatre will kick off its classical season on Friday, November 2, 2018 at 7:00 p.m. with a unique concert by Boston-based artist Michael Hawley. Hawley, a pianist, educator, computer scientist, and photographer, will celebrate the music of Bernstein, Bach, Chopin and others as part of a piano performance and lecture. “I heard Michael Hawley perform at an arts conference I attended in New York City and I immediately knew he would be an exciting pianist/speaker to add to this year’s classical season at the Gracie. He has a huge breadth of knowledge about music, science, education and art. Michael’s unique concert and lecture style will enhance the audience’s knowledge and appreciation of classical music,” said Jeri Misler, managing director of the Gracie Theatre. His program features some spectacular organ pieces by Johann Sebastian Bach that were arranged for performance on the piano by Hawley and Franz Liszt. The concert will also feature music by Frederic Chopin with some exquisite arrangements by Leopold Godowsky. The all-American second half of the concert will feature two memorable Bernstein arrangements — the “Overture to Candide”, and the symphonic dances from “West Side Story,” and some compositions by William Bolcom. Since August, musicians around the world have been celebrating the 100th birthday of Leonard Bernstein with concerts devoted to his music. The performance will also feature remarks and illustrations. 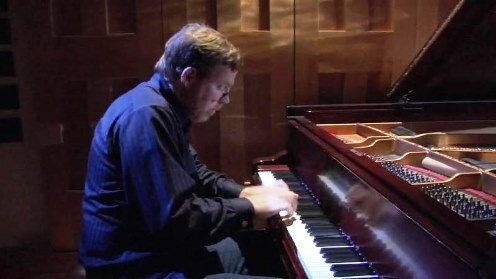 As a concert pianist, Hawley won the Van Cliburn amateur competition in 2002. He has soloed with the Boston Pops, the Fort Worth Symphony and at the Newport Music Festival. Educated at Yale and MIT, Hawley held industrial positions at Bell Labs, IRCAM in Paris, Lucasfilm in San Rafael, and NeXT in Palo Alto. For many years, he was the Alex Dreyfoos Professor of Media Technology at MIT. Hawley is the director and a frequent presenter at the annual EG Conference, an annual gathering of innovators driving creative industries. In addition, Hawley has a passion for photography and produced a notable photographic book on Bhutan. While he is on campus, Hawley will teach an afternoon master class to Husson students at the New England School of Communications and undergraduates studying computer technology at the University’s College of Business. The master class entitled “Bit and Pieces,” explores the intersection between music and information technology. There is no charge to attend the master class. Tickets for the concert are $15 - $25 and are available by calling the Gracie Box office at (207) 941-7888 or emailing the box office at gracietheatre@husson.edu. They can also be ordered online through the Gracie’s website at www.gracietheatre.com. The Gracie’s season is made possible with support from Bangor Savings Bank. The theatre also gratefully acknowledges the generous support provided throughout the season by additional show sponsors including: Downeast Toyota, Pepsi and the Dead River Company. This season, the Gracie is offering a "You Pick 4" plan which allows patrons to sculpt their own season package. When a patron selects any four shows, the prices of each ticket are automatically reduced by 15-20 percent. Patrons who select this plan will be offered individual discounts for some of the other shows in the season and have their choice of seats in our premium section for the plan shows. This "You Pick 4" offer is only available at the Gracie Theatre box office by calling (207) 941-7888, or by stopping by the box office located in the Beardsley Meeting House on the campus of Husson University in Bangor. Single show tickets are also available at their regular price. Ticket prices range from $28-49.00 depending on the show and are available by calling (207) 941-7888 or online at www.gracietheatre.com. Completed in October of 2009, the Gracie is Husson University's center for the fine and performing arts. This beautiful 500-seat theatre is considered one of Maine’s premier performance venues. In addition, the Gracie also serves as a learning platform for students from the New England School of Communications in digital audio, sound mixing, set design and construction, lighting, acting and electronics. For more information, visit GracieTheatre.com.